Ali Hassan Abd al-Majid al-Tikritieh (Arabic: علي حسن عبد المجيد التكريتي‎ ʿAlī Ḥasan ʿAbd al-Majīd al-Tikrītī, 30 November 1941 – 25 January 2010) was an Iraqi minister. He was a member of the Baath Party. During his life, he was Defense Minister, Interior Minister, military commander and chief of the Iraqi Intelligence Service. He was also the governor of occupied Kuwait during the Gulf War. He was a first cousin to the late President of Iraq Saddam Hussein. During the 1980s and 1990s, he became notorious for his role in the Iraqi government's campaigns against internal opposition forces, namely the ethnic Kurdish rebels of the north, and the Shia religious dissidents of the south. Repressive measures included deportations of the population and mass killings; al-Majid was dubbed "Chemical Ali" by Iraqi Kurds for his use of chemical weapons in attacks against them. 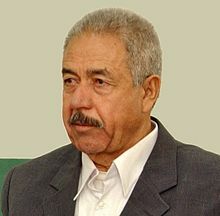 Al-Majid was captured after the 2003 invasion of Iraq and was charged with war crimes, crimes against humanity and genocide. He was convicted in June 2007 and was sentenced to death for crimes committed in the al-Anfal campaign of the 1980s. His appeal against the death sentence was rejected on 4 September 2007, and was sentenced to death for the fourth time on 17 January 2010. Al-Majid was executed by hanging eight days later.